November and December contain two of our most cherished holidays as Christians and as Americans. With these holidays comes the emphasis on special foods. It is a blessing to have enough food to sustain us and to be able to share it with others during our family and community celebrations. 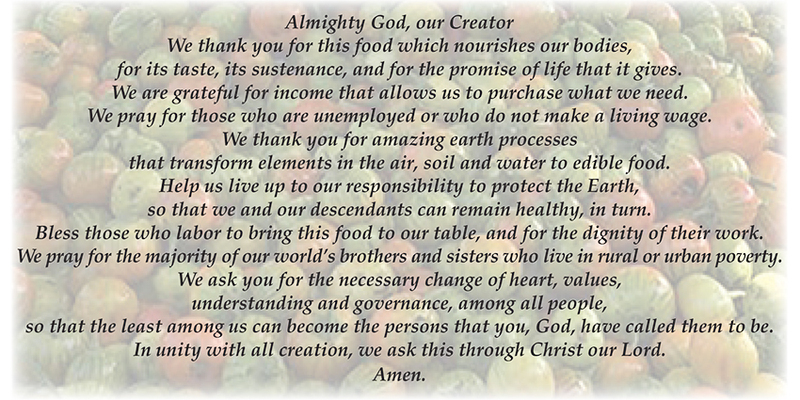 During holidays and every day, our prayer at mealtime serves to thank God for what we receive. It can be expanded for greater unity, to honor the relationships that Pope Francis calls for us to nurture in equal part: relationship with God, with the Earth and with one another. The food we eat unites us with God, with people and with the Earth through its production, harvest, sale and preparation. If we articulate that in our prayer, perhaps even visualizing a particular food item going from farm to table, we are reminded of our inseparable bond with the Earth and with the network of people who bring our food to us. These bonds are better understood and strengthened by our very reflection on them. And this contemplation, in turn, is a gift. It brings us into the wholeness of creation, cultivating our awareness and helping to ground us in what is important in this life. We become more mindful of those who don’t have what we have, which hopefully translates positively to our lifestyle/consumer decisions, our volunteerism, our charitable giving, etc. Being more intentional in our mealtime prayer also, no doubt, causes us to reflect on the nutritional benefit (or not) of the food we’re choosing. We can think about its source and whether it is produced in a sustainable or ethical way. Maintaining solidarity with others is an important and necessary component of being a Christian. It is the work of peacebuilding as we cultivate these relationships, opening our heart wider to the Holy Spirit, which leads to personal transformation and fulfillment. My prayer below can be used for grace at meals or as you like. If you’re not accustomed to including these elements in your prayer, I invite you to give it a try for a while and see what you think. It’s not about being perfect, it’s about being intentional and aware and making the best choices you can in your particular situation and circumstances. I pray that at your mealtimes, you are able to slow down, connect and let your prayer and your food feed you — body, mind and soul.